Uncle Harry’s® might be the fastest growing ice cream cake brand in America, but our beginnings were a bit more humble. Uncle Harry’s® has been inspiring celebrations and putting smiles on faces since 1987. Through the years, we have earned a reputation as one of the best premium ice cream cakes in the United States. In recent years, our dedication to taste and quality has made Uncle Harry’s® the fastest growing ice cream cake brand in America. Of course, we weren’t always a national brand. Uncle Harry’s® first started out as a gourmet ice cream shop in Virginia Beach, Virginia. From our beginning, we used only the finest ingredients and fresh cream to make our premium ice cream and ice cream cakes. The taste of our rich and creamy ice cream quickly made Uncle Harry’s® a locals’ favorite. Our popularity led to a second Uncle Harry’s® shop and eventually a dozen ice cream shops in Virginia. In 2001, we experimented with selling a small number of our ice cream cakes in area supermarkets including Ukrops and Farm Fresh. The cakes became a hit and we soon found ourselves in the ice cream cake business. 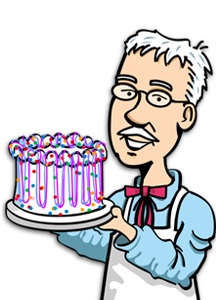 We eventually closed our ice cream shops and turned all our efforts into making richer, creamier, and tastier ice cream cakes and desserts. This commitment has led to Uncle Harry’s® Premium Ice Cream Cakes being offered in more and more supermarkets. Today, you can find our ice cream cakes in thousands of supermarkets in over 30 states — still inspiring celebrations and putting smiles on faces!